Ceramic clear braces are made of clear materials and are therefore less visible on your teeth than metal braces. For this reason, these braces are used mainly on older teenagers and adult patients who have cosmetic concerns. While they are visually less prominent, they do require more attention to oral hygiene as ceramic braces are larger and more brittle than their metal counterparts. For these reasons, ceramic braces tend to be used on upper front teeth more than lower teeth. What are Ceramic Clear Braces? Ceramic braces are a less noticeable type of braces used for straightening teeth in adults and teens who are concerned about the cosmetic appearance of their braces. These braces are secured to your teeth and are tightened at regular intervals by the orthodontist just like traditional metal braces. You may experience some soreness after each tightening session. This is a normal result of your teeth being shifted into alignment. The length of the intervals will be determined during an initial appointment with our orthodontist. The main advantage is that they are much less noticeable than traditional braces. This is especially appealing to older teens and adults who prefer not to draw more attention to their teeth when with friends or during public speaking engagements. Ceramic braces are made of different materials than traditional braces. The brackets are made of clear or tooth colored materials so that they are less visible. Keep in mind that there is still a need for a wire to go across the teeth to align them. The main disadvantage is that they can stain if they are not properly cared for. To prevent staining, one must limit the amount of coffee and other staining foods and drinks and brush regularly. If you do happen to stain your braces, the wire can be changed out at your next orthodontist appointment. During your first appointment, the orthodontist will go over the amount of time that you will wear the braces and how often they will be tightened. They will clean and dry your teeth and then put on a bonding agent to hold the brackets. Once the brackets are on, the orthodontist will attached the wire to the brackets with small rubber bands. Once the wire has been tightened, you will be ready to go home. It is normal to feel sore after this but it will usually go away after a week. During this time it may be helpful to eat soft foods and use over-the-counter pain relief medicines. 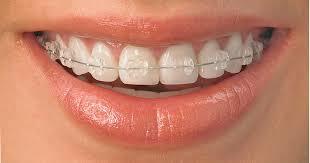 Having braces can be a change, but you will get used to them after a while and even forget that they are there. When you choose this type of braces, other people will forget that they are there too. Call our orthodontist office today at 562-912-2007 or contact us online to learn more about ceramic clear braces and our other braces options. We look forward to speaking with you and getting you a smile that you will be proud to show off.